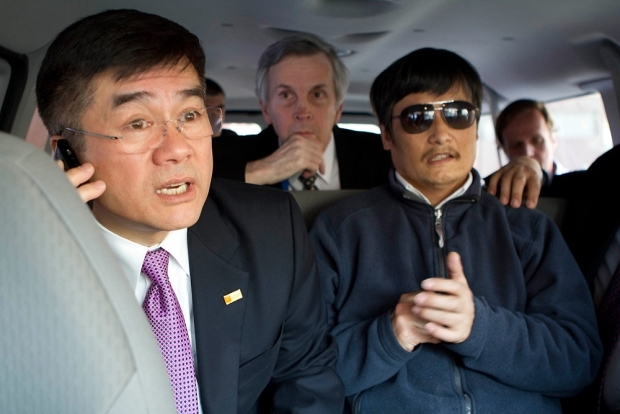 Chinese dissident Chen Guangcheng, right, listens on as U.S. Ambassador to China Gary Locke talks on the phone May 2, 2012 in Beijing, China. The U.S. had maintained silence after the activist fled to the U.S. embassy on April 26, but U.S. officials opened up over what they say had become a warm relationship with Chen as they negotiated for his safety. Joining Kaiser Kuo and Jeremy Goldkorn on Sinica this week are special guests Gady Epstein from the Economist and Ed Wong from the New York Times, here to discuss what has been a surreal two weeks even by Chinese standards, bringing us the spectacle of a blind activist’s refuge in the American Embassy in Beijing, the ensuing diplomatic negotiations for his release, and an upsurge of popular Chinese outrage over a maritime dispute with the Philippines. Our guests also chat about “Ferrari-gate” and address the persisting rumors that a tuxedo-clad princeling drove up to the U.S. Ambassadorial residence in a red Ferrari.